HOUSTON–North American oil and gas companies and energy services providers are following with a keen and vested interest the news coming out of Washington regarding the “Frac Act,” a congressional proposal to amend the Safe Drinking Water Act to remove a 2005 Energy Policy Act exemption on hydraulic fracturing and effectively give the U.S. Environmental Protection Agency the authority to regulate fracturing operations. A year or two ago, no one outside of the upstream oil and gas industry even knew what a hydraulic fracture was. Today, senators, congressmen and journalists are discussing fracturing as if they were career frac engineers. A number of key questions are central to the debate over the Frac Act. Is there a cleaner fossil fuel available than natural gas? Is natural gas abundant in North America and many other parts of the world? Has the growth of unconventional gas in the past decade, primarily from shale, materially added to the recoverable gas (and sometimes oil) reserves in North America, eliminating the need for natural gas imports? Does this improve our energy security? Does incremental production create new sources of tax revenues and local jobs? Is there a more impacting service in low-permeability reservoirs than hydraulic fracturing? Does hydraulic fracturing imperil groundwater supply? Whoa, let’s park the pump trucks here for a moment. On March 17, 1949, a team comprised of Stanolind Oil Company and Halliburton personnel converged on a well about 12 miles east of Duncan, Ok., to perform the first commercial application of hydraulic fracturing. Later the same day, Halliburton fractured another well near Holliday, Tx. The technique had been developed and patented by Stanolind and an exclusive license was issued to Halliburton to perform the stimulation process. In 1953, the license was extended to all qualified service companies. Since that fateful day in 1949, hydraulic fracturing has done more to increase recoverable reserves than any other technique. In the more than 60 years following those first treatments, more than 2 million frac treatments have been pumped with no documented case of any treatment polluting an aquifer. Recent proposals have been initiated by Congress to limit hydraulic fracturing in order to protect groundwater supplies. To limit or eliminate hydraulic fracturing would, of course, be extremely detrimental to domestic supplies of oil and natural gas. In most low-permeability reservoirs, the wells simply will not produce without the fracturing process. As many as 90 percent of all gas wells completed in the United States have been fractured, and the process continues to be applied in new and innovative ways to boost production of American and worldwide energy in unconventional formations, such as tight gas sands, shale deposits and coalbeds. Conventional, higher-quality reservoirs also benefit from hydraulic fracturing in the form of accelerated recovery. 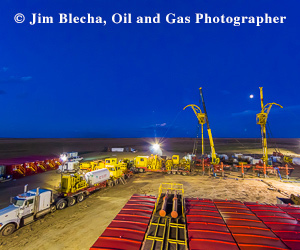 As a result, hydraulic fracturing is now responsible for 30 percent of domestic oil and natural gas reserves, and has aided in extracting more than 600 trillion cubic feet of natural gas and 7 billion barrels of oil, with much more to come. According to the National Petroleum Council, 60-80 percent of all wells drilled in the United States during the next decade will require fracturing to remain viable. The reason, simply put, is that the low-hanging fruit in the oil and gas industry is largely gone. Going forward, new oil and gas supplies increasingly will have to be recovered from lower-quality and unconventional reservoirs. The concerns around groundwater contamination raised by Congress are primarily centered on one fundamental question: Are the created fractures contained within the target formation so that they do not contact underground sources of drinking water? In response to that key concern, this article presents the first look at actual field data based on direct measurements acquired while fracture mapping more than 15,000 frac jobs during the past decade. Studies conducted by governmental agencies and respected authorities have unanimously concluded that hydraulic fracturing is safe. The Environmental Protection Agency, the Ground Water Protection Council and the Interstate Oil & Gas Compact Commission all have found hydraulic fracturing nonthreatening to the environment or public health. As displayed on the Energy in Depth Web site (http://www.energyindepth.com/), the GWPC’s survey of state energy regulatory agencies found no documented cases of contaminated drinking water linked to hydraulic fracturing. The GWPC also concluded that state regulations were sufficient to ensure the integrity of the water supply. A 2002 study conducted by the IOGCC confirmed the GWPC’s conclusion that no evidence could be found of contaminated drinking water related to hydraulic fracturing. In addition, the EPA conducted an extensive survey of hydraulic fracturing practices and their effect on drinking water in 2004. Focusing on very shallow coalbed methane wells (since their extremely shallow depths would have the highest potential of harming the water supply), the EPA found that several factors (fluid recovery, the small amount of chemicals contained in frac fluids, their dilution in water, and their absorption by rock formations) minimize the potential risks associated with hydraulic fracturing. The EPA agreed with the GWPC and the IOGCC that hydraulic fracturing is safe. More specifically, the EPA concluded that hydraulic fracturing does not create pathways for fluids to travel between rock formations to affect the water supply. At a state regulators conference in Washington last February, Steve Heare, director of EPA’s Drinking Water Protection division said, “I have no information that states are not doing a good job already (of protecting water supplies).” Despite claims by environmental organizations, Heare also reported that he had not seen any documented cases where hydraulic fracturing was contaminating water supplies. ICF International recently completed another key study that specifically addressed hydraulic fracturing activities in the Marcellus Shale play in New York. The study confirmed that the EPA findings were valid and found that there would not be any risks to drinking water from hydraulic fracturing in the Marcellus Shale region. Extensive mapping of hydraulic fracture geometry has been performed in unconventional North American shale reservoirs since 2001. The microseismic and tiltmeter technologies used to monitor the treatments are well established, and are also widely used for nonoil field applications such as earthquake monitoring, volcano monitoring, civil engineering applications, carbon capture and waste disposal. Figures 1 and 2 are plots of data collected on thousands of hydraulic fracturing treatments in the Barnett Shale in the Fort Worth Basin in Texas and in the Marcellus Shale in the Appalachian Basin. The deepest water wells in each of the counties where Barnett Shale fracs have been mapped, according to United States Geological Survey (http://nwis.waterdata.usgs.gov/nwis), are illustrated by the dark blue shaded bars at the top of Figure 1. As can be seen, the largest directly measured upward growth of all of these mapped fractures still places the fracture tops several thousands of feet below the deepest known aquifer level in each county. The results from our extensive fracture mapping database show that hydraulic fractures are better confined vertically (and are also longer and narrower) than conventional wisdom or models predict. Even in areas with the largest measured vertical fracture growth, such as the Marcellus, the tops of the hydraulic fractures are still thousands of feet below the deepest aquifers suitable for drinking water. The data from these two shale reservoirs clearly show the huge distances separating the fracs from the nearest aquifers at their closest points of approach, conclusively demonstrating that hydraulic fractures are not growing into groundwater supplies, and therefore, cannot contaminate them. It is true that sound engineering practices make exceptional wells. But it also can be said that sound engineering practices make for a safe environment. Today’s combination of proven, measurement-based engineering practices, optimal fracture treatment designs and direct mapping measurements has led to the production success now enjoyed in low-permeability and unconventional gas plays in the United States and around the globe. Those same best practices also ensure that our drinking water supplies are protected for generations to come. KEVIN FISHER is general manager of Pinnacle, a Halliburton Service, and is involved in integrating real-time fracturing diagnostics with fracture modeling to optimize the hydraulic fracturing process. He began his career with Halliburton in 1979 and served for 14 years as a logging engineer, field supervisor, log analyst, U.S. sales manager and global technical marketing manager. He joined ProTechnics as director of sales and marketing in 1993 and Pinnacle in 2000. Fisher holds five U.S. patents related to spectral gamma ray, gravel pack density logging, and tiltmeter instrumentation. He holds a B.S. in natural science/physics from Cameron University.